Data loss is disastrous for any business, especially in the age of big data where companies rely on digital information to refine their marketing, contact prospects, and process transactions. 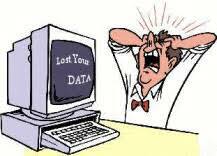 Reducing the chances for data loss is a vital part of a data management strategy. 6) Damage due to spilled drink or water. But if a loss does occur, then there are several best practices you can implement to boost your odds of recovery. Here's a look at top ways you can protect your data from loss and unauthorize access. The single most important step in protecting your "data from" loss is to back it up regularly. How often should you back up? That depends how much data can you afford to lose if your system crashes completely? A week's work? A day's work? An hour's work? There are also numerous third-party backup programs that can offer more sophisticated options. Whatever program you use, it's important to store a copy of your backup offsite in case of fire, tornado or other natural disaster that can destroy your backup tapes or discs along with the original data. You always want more than one backup system. The general rule is 3-2-1. You should have three backups of anything that's very important. They should be backed up in at least two different formats, such as in the cloud and on a hard drive. There should always be an off-site backup in the event that there is damage to your physical office. However, these share-level permissions won't apply to someone who is using the local computer on which the data is stored. If you share the computer with someone else, you'll have to use file-level permissions (also called NTFS permissions, because they're available only for files/folders stored on NTFS-formatted partitions on your computer.). File-level permissions are set using the Security tab on the properties sheet and are much more granular than share-level permissions. In both cases, you can set permissions for either user account or groups, and you can allow or deny various levels of access from read-only to full control. Many productivity applications, such as Microsoft Office applications and Adobe Acrobat, will allow you to set passwords on individual documents. To open the document, you must enter the password. To password-protect a document in Microsoft Word 2003, go to Tools Options and click the Security tab. You can require a password to open the file and/or to make changes to it. You can also set the type of encryption to be used. Unfortunately, Microsoft's password protection is relatively easy to crack. There are programs on the market designed to recover Office passwords, such as Elcomsoft's Advanced Office Password Recovery (AOPR). This type of password protection, like a standard (non-deadbolt) lock on a door, will deter casual would-be intruders but can be fairly easily circumvented by a determined intruder with the right tools. Windows 2000, XP Pro, and Server 2003 support the Encrypting File System (EFS). You can use this built-in certificate-based encryption method to protect individual files and folders stored on NTFS-formatted partitions. Encrypting a file or folder is as easy as selecting a check box; When operating your computer just click the Advanced button on the General tab of its properties sheet. Note that you can't use EFS encryption and NTFS compression at the same time. Note that EFS is for protecting data on the disk. If you send an EFS file across the network and someone uses a sniffer to capture the data packets, they'll be able to read the data in the files. There are many third-party products available that will allow you to encrypt an entire disk. Whole disk encryption locks down the entire contents of a disk drive/partition and is transparent to the user. Data is automatically encrypted when it's written to the hard disk and automatically decrypted before being loaded into memory. Some of these programs can create invisible containers inside a partition that act like a hidden disk within a disk. Other users see only the data in the "outer" disk. 7. Make use of a public key infrastructure. You can use a steganography program to hide data inside other data. For example, you could hide a text message within a.JPG graphics file or an MP3 music file, or even inside another text file (although the latter is difficult because text files don't contain much redundant data that can be replaced with the hidden message.). Steganography does not encrypt the message, so it's often used in conjunction with encryption software. The data is encrypted first and then hidden inside another file with the steganography software. 9. Protect data in transit with IP security. Your data can be captured while it's traveling over the network by a hacker with sniffer software (also called network monitoring or protocol analysis software). To protect your data when it's in transit, you can use Internet Protocol Security (IPsec) -but both the sending and receiving systems have to support it. Windows 2000 and later Microsoft operating systems have built-in support for IPsec. Applications don't have to be aware of IPsec because it operates at a lower level of the networking model. Encapsulating Security Payload (ESP) is the protocol IPsec uses to encrypt data for confidentiality. It can operate in tunnel mode, for gateway-to-gateway protection, or in transport mode, for end-to-end protection. To use IPsec in Windows, you have to create an IPsec policy and choose the authentication method and IP filters it will use. IPsec settings are configured through the properties sheet for the TCP/IP protocol, on the Options tab of Advanced TCP/IP Settings. Data that you send over a wireless network is even more subjects to interception than that sent over an Ethernet network. Hackers don't need physical access to the network or its devices; anyone with a wireless-enabled portable computer and a high gain antenna can capture data and/or get into the network and access data stored there if the wireless access point isn't configured securely. If you need to send data to others but are worried about protecting it once it leaves your own system, you can use Windows Rights Management Services (RMS) to control what the recipients are able to do with it. For instance, you can set rights so that the recipient can read the Word document you sent but can't change, copy, or save it. You can prevent recipients from forwarding e-mail messages you send them and you can even set documents or messages to expire on a certain date/time so that the recipient can no longer access them after that time. To use RMS, you need a Windows Server 2003 server configured as an RMS server. Users need client software or an Internet Explorer add-in to access the RMS-protected documents. Users who are assigned right also need to download a certificate from the RMS server. Around 44% of all data, loss is caused by hardware failure. It's important to make sure that you immediately shut your system down if you suspect that hard drive has crashed. Don't even try to go through the shutdown procedure, just pull the plug from the wall. Do not try to run off the shelf data recovery software or drive utilities. Many times these applications will assume the drive is functioning properly and will increase the risk of permanent data loss. When we discuss data recovery in this report, we will primarily focus on issues surrounding hard drive failures; since these types of failures are most common. There are really two primary forms of failure in a hard drive, logical and physical. Logical failures are usually a result of file-system corruption. This can occur due to a virus, accidental deletion of key files or registry components, and in some cases even electro-static discharge. In most cases where a logical failure has occurred, the drive is still recognized by the system BIOS, but it will not boot. In most cases, your data should still be intact on the drive, even though it may appear to be inaccessible. If the system BIOS does not detect the presence of the hard drive, then chances are a physical failure has occurred. Physical failures can result from a wide variety of causes. There are really two sub-categories for physical hard drive failures; mechanical and electronic. Mechanical failures usually result from a failure of the spindle motor. Spindle motor failure can result from excessive heat due to a bearing failure. The increased heat resulting from the bearing failure will expand the drive shaft and therefore seize the spindle motor. Suddenly, your drive will become inoperative. Occasionally, you will get a warning that something bad is about to happen.You may hear a loud whining, a grinding noise, even high-pitched screeches. If anything like this starts to occur, BACK UP YOUR DATA IMMEDIATELY. Another physical issue that sometimes rears its ugly head is an electronic failure. If you look at a hard drive, you will notice a circuit board on the bottom. This board is basically the brains of the drive, and it is where the computer interfaces to the hard drive. An electrical failure can occur unexpectedly at any time. Even brand-new hard drives are not totally immune to having electrical failures. Sometimes it's just a faulty component, sometimes it's improper installation (i.e. electro-static discharge, grounding out the board, damaging circuitry during installation). It's important to also keep your system clean and well ventilated, since excessive heat can damage the electrical components on the drive. If you have a system that is in a somewhat contained area, you may look at adding an additional 80mm fan to cool the internal components of the system, especially the hard drive. No other component of a computer works as much as the hard drive, and therefore it is vitally important not to overlook it when cooling issues arise. • How Is My Data Recovered? One of the most often asked questions that customers ask is, "how do you get my data back? Well, it's really not black magic or rocket science. It's just a matter of having the right tools and the knowledge necessary to know what to do, much like a surgeon performing heart by pass surgery. Many prominent data recovery facilities have a large array of hardware, software and tools for recovering data. Generally speaking when a hard drive is received by a data recovery firm, the first thing they do is evaluate it and determine what recovery solution will be necessary. If the drive failure is a logical issue as mentioned earlier, then a scan of the drive will be performed to try and repair the file system corruption. Sometimes a partition can be repaired and the drive restored to the status that it was before the failure. If this is not possible, then a very low-level scan will be performed that essentially searches every sector of the hard drive for files. Once the files are located, they can then be copied to the media of choice, i.e. a CD-ROM, DVD-ROM or another hard drive. Logical recoveries can take up an enormous amount of time, especially if the drive is on the verge of physical failure. It's not uncommon to allow for one day of scanning and a day for recovering the found files. If the drive has suffered a physical failure, then the recovery procedure is quite a bit more challenging. As mentioned above, there are really two sub-categories of physical failure; mechanical and electronic. An important element in recovering data from a physical failure is having the necessary parts to get the drive functioning again. Unfortunately with hard drives if you have a 20GB Maxtor Hard Drive for example, then you will need another identical 20GB Maxtor Hard Drive for salvaging parts. In cases where the electronic circuit board has failed on the hard drive, then you have to have the exact same circuit board on hand in order to retrieve the necessary circuit components for replacement. Many times you cannot even exchange circuit board for circuit board. These repairs generally require soldering skills and a thorough knowledge of electronics to be successfully completed. You will most likely hear "Class100 Clean Room" thrown around a lot when talking to data recovery professionals. Simply stated, a Class100 Clean Room maintains exceptional air purity and contains less than 100 airborne particles larger than 0.5 microns in each cubic foot of air. This is vital in protecting sensitive internal components of hard drives. Anytime a hard drive is having an invasive procedure performed on it, a Class100 clean room or better is needed. This is one area where you really do get what you pay for. Try to stay away from software in the $20-$60 range, since these utilities are generally very limited in what they can do. Also make sure that you NEVER and just to emphasize, NEVER EVER get data recovery software that writes anything at all to the damaged disk. You run the risk of overwriting data that may otherwise have been recoverable, but will be lost forever.If you are fairly computer savvy, then there are a few good data recovery software solutions available. There's an old saying, "you get what you pay for. "In most cases this is true. However, just because a company with a fancy website quotes you $3,500 for data recovery, does not mean that they are any better than a company that quotes you $1,500. Also, try to stay away from companies that want to charge $50-$300 for evaluating your drive. There has been a movement in the data recovery industry over the last couple of years to offer a number of free services. Most reputable data recovery companies will evaluate standard IDE drives free of charge; so don't let the word "free" this or "free" that stop you. The data recovery market is quickly becoming saturated, and a company does not necessarily cheapen itself or lack expertise by offering free evaluations. You will find as you shop around for data recovery that prices vary greatly. You will get quotes that range from $300 to $5,000 for standard hard drive recoveries. It's not uncommon to literally get quotes that have at least a $1,500 high/low spread. We shopped one prominent data recovery company where we gave them specific indicators of a physical hard drive failure. We were eventually quoted a price range of $600 to $2,900 for the recovery. Many times this is a bait and switch type tactic. They get you to send in the drive with the low-end $600 price, then they let you know it's going to cost $2,100 for the recovery. You end up being well under the $2,900 high-end price, but well over what other reputable companies would charge. Since most customers won't go through the pain of having the drive sent back, only to have to send it out to another company, these bait and switch companies end up making huge profits off of unsuspecting customers. Try to find a company that will give you an up front cost for either a logical or physical recovery. Most companies will be able to tell you within a couple hundred dollars the cost of a recovery. However, don't misunderstand a company that gives you a price for two different procedures. For example, some companies will give you a price if the failure is logical and a price if the problem ends up being physical. We called one firm and were told that if the drive had a logical failure the price would be $400 and if it ended up being a physical issue the price would be $1,600.This is not a high/low spread as mentioned in the earlier example, this is simply quoting a price for two different types of recoveries. On average you can expect to pay anywhere from $400 to $600 for logical recoveries, and $1,200 to $2,000 for physical recoveries on standard IDE hard drives. If you have RAID drives, SCSI, etc. depending on the configuration prices can be as high as $15,000. Remember, backup!! • Hello, Can My Data Be Recovered? If you have a hard drive that has crashed, the most important thing you can do is contact a data recovery professional immediately. Make sure you aren't being charged an evaluation fee if you have a standard IDE hard drive.Most companies only charge evaluation fees for complex RAID and network server drives. Is the drive recognized by the computer or not? Good luck in getting your data recovered and make sure you always backup your important information on a daily basis.